The full Los Angeles City Council is due to vote this Friday on the newly drawn council district map, which moves Little Tokyo from the 9th District into the 14th District. The council district map also divides Koreatown into the 10th and 13th districts. Every 10 years Los Angeles City Council lines are redrawn to account for changes in the population as tabulated in the U.S. Census. The goal is to have equal population in each of the 15 districts. The new district map must also comply with the U.S. Constitution and the Voting Rights Act of 1965. The map created by the 21-member Los Angeles City Council Redistricting Commission has drawn heavy criticism from Councilmembers Jan Perry and Bernard Parks, as well as the Koreatown community, who have all threatened legal action. Last week, the City Council held three consecutive days of public hearings on the maps. 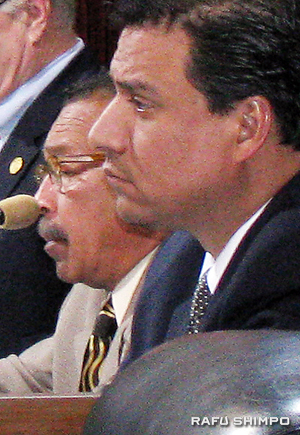 Councilmembers Herb Wesson and Jose Huizar listen during a public hearing on redistricting on March 7. “The people who are dissatisfied span the entire city and they (concern) a variety of racial, community, and organizational groups. Their message is clear: this map does not serve the interests of the people of Los Angeles,” Perry said. 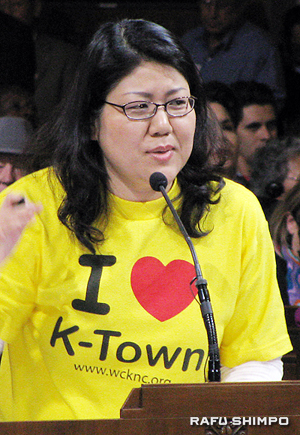 Representatives from Little Tokyo, including Union Church, expressed their desire to remain in the 9th District during the hearing at City Hall on March 7. Tim Yee, pastor of Union Church, said that many in Little Tokyo feel that their voices have not been heard on the issue. “The most recent developments moving Little Tokyo out of the 9th and away from decades of relationship-building including our friends from South L.A. is very distressing and reflects a lack of listening to the people in these neighborhoods,” said Yee.